Exhibiting artist Xiaojing Yan and guest curator Tyler Russell lead a tour and discussion as a preview to the exhibitions, Wen-Li Chen: To My Unborn Child and Xiaojing Yan: In Suspended Silence. Free admission, everyone welcome to attend. The opening reception for the exhibitions will follow immediately after the Artist Talk and Tour. Wen-Li Chen: To My Unborn Child is the first Canadian solo exhibition by Taiwanese artist Wen-Li Chen. Guest curated by Centre A, Vancouver International Centre for Contemporary Asian Art, To My Unborn Child is a new installation including various modes of image making by Chen, an artist contending with her inheritance of Kavalan and Sakilaya Indigenous cultures from her paternal side and her maternal Han Chinese culture. The installation depicts historical artifacts juxtaposed with fictional elements that blur together memories, colloquialisms,family biographies, and local histories from Chen’s life before immigrating to the United States in 2015. Xiaojing Yan: In Suspended Silence is the first West Coast solo exhibition of Ontario-based artist Xiaojing Yan. Featuring two bodies of work, Mountains of Pine and the Lingzhi Girl series within this immersive exhibition, Yan explores natural and cultural realms deeply grounded in Daoist philosophies, myths and folklore. Presenting works that draw from traditional Chinese art, iconography and symbolism, In Suspended Silence highlights Yan’s poetic explorations into spirituality and self-transformation. 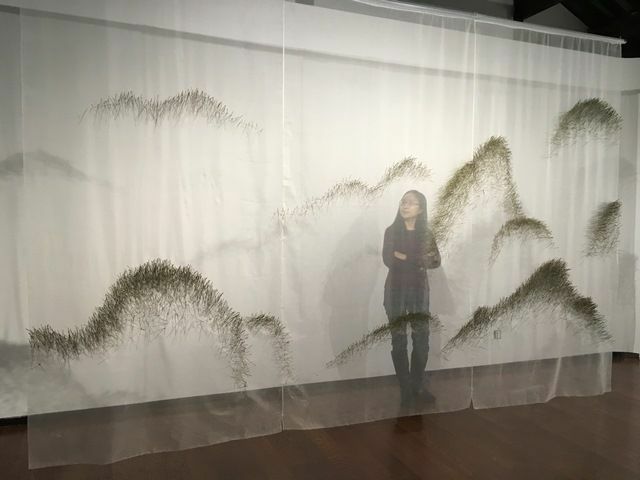 Above: Xiaojing Yan, Mountain of Pines, 2018. Photo by: Xiujuan Sun.